A year ago we planted the plowed ground in hardwood trees spaced in 10-foot rows. The area, slightly over an acre, has become a meadow of wildflowers. It will be several years before the trees shade the ground and change the nature of the understory. For now, wildflowers grow in the full sun on the gentle slope of the natural bank of a Mississippi River tributary. 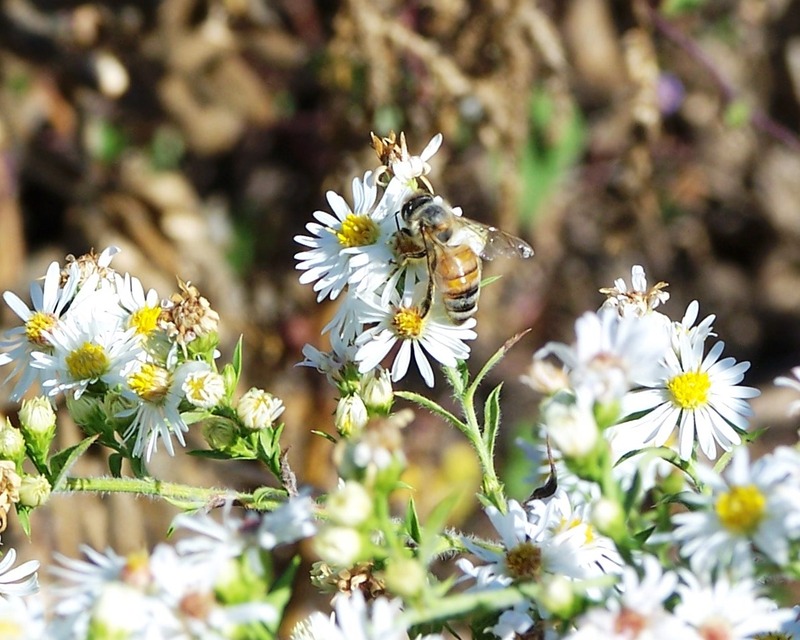 A visit to the field on a warm and sunny fall day finds numerous species of insects feeding on fall asters. The remote meadow actually buzzes from the number of bees in flight. There are many honey bees collecting nectar and pollen from white heath asters as well as several species of bumblebees and numerous species of solitary bees. Many sweat bees and other extremely small bees are present in the bright composite flowers. Flies that mimic the appearance of a bee or wasp are common in the meadow. They are protected from many predators by their yellow and brown stripes and transparent wings. Only their bulging fly eyes give away their true identity. The wildflowers, mostly fall asters, attract many species of butterflies. Songbirds dart through the three-foot-tall tangle of wildflowers. The one-acre plot, providing food and habitat, is obviously an oasis for honey bees and many species of native pollinators. In the years that the ground is exposed to the sun, it will provide a sequence of blooming flowers as well as protective cover and nesting material for pollinators. Such pollinator meadows, or pastures, are seen as important spaces providing for a diverse population of pollinator species in agricultural areas. The large fields planted in modern industrial agriculture are often too wide for the smaller bees to fly across. To increase crop yield, some farms are incorporating pollinator meadows along field margins or between plantings to accommodate important native pollinators. Click on today’s photo of a honey bee collecting nectar from white heath asters, important plants for winter survival honey stores. The soybean is an important honey plant, but not all soybean varieties produce enough nectar to produce a surplus of honey. A beekeeper asked me which varieties of soybeans are the best sources of nectar for making honey. I wish that I could answer this clearly, but I can’t. To try to get some answers, I visited an agricultural research facility where soybean varieties are being developed and tested. Discussing soybean variety characteristics with a researcher, I learned that the amount of nectar offered by a soybean variety is of importance to beekeepers; but it is not a trait that is selected in developing soybeans. The traits that are important to soybean growers include yield, nutrition, and tolerance to pests, disease, and drought. 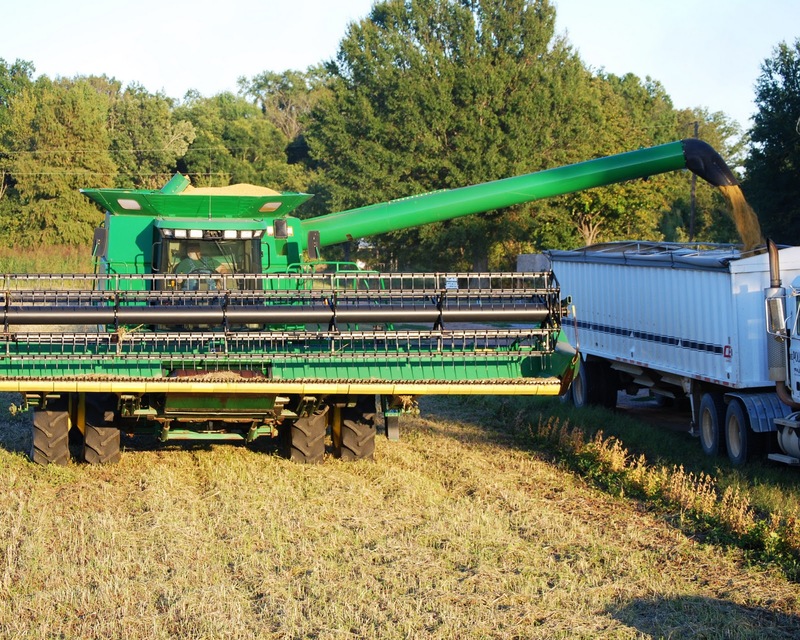 Seed producers also divide soybean varieties according to planting, bloom, and harvest times. Soybeans in any location often include both early and late season varieties. Planting different fields with different varieties helps the farmer spread out the harvest. This benefits honey producers with bee hives near the soybean fields by extending the bloom period, often by several weeks. I also spoke with several Arkansas beekeepers this week. We discussed honey production around soybean fields. Their thoughts regarding soybeans as important honey plants involved the location and soil type of the fields. For example, beekeepers on the west side of Arkansas’ White River make little honey from soybeans, while beekeepers on the east side of the river make a considerable amount of soybean honey. Soybeans grown on land close to the Mississippi River generally produce considerable amounts of nectar. New soybean varieties are being developed, like one being grown this year for use with new herbicides. Repeated use of a single herbicide led to resistance in crop weeds. Regardless which varieties are planted, honey bees can usually fly far enough to find one that is attractive, even if they have to fly over soybeans offering less reward. Beekeepers can’t simply list good soybean varieties. 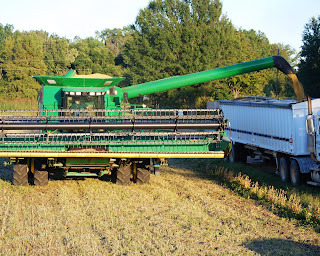 Today’s photo: harvesting soybeans. Bumblebees are foraging on early fall flowering plants. They can be found in abundance on the open flowers of vitex trees and goldenrod. 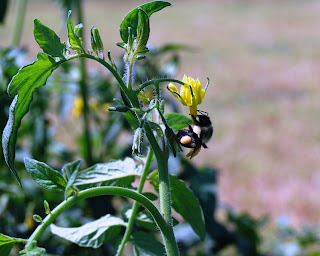 Other bumblebees are pollinating late-blooming tomato plants, like the one in today’s photo. Click on the photo to see the bumblebee’s pollen baskets filled with light-colored pollen. Bumblebees carry pollen on their hind legs similar to honey bees. The bumblebee vibrates the flower using its flight muscles to dislodge pollen in action similar to the honey bee’s use of flight muscles to generate heat to warm the cluster of bees in the wintertime. The bumblebee’s long tongue and buzz pollination capability make it an effective pollinator of many vegetables. The warm, sunny early fall days reveal numerous species of bees, wasps, and other insects. Honey bees are dragging drones from the hives. Worker bees returning to the hive with hind leg baskets full of pollen are passing workers stinging and dragging drones. The workers’ stings, though barbed, penetrate the soft exoskeleton of other bees without tearing from the bees’ abdomen as when they sting a human. Red wasps seek shelter and warmth on cool nights under the edge of bee hive covers. Large numbers of red wasps gather around vegetable plants looking for caterpillars. While red wasps are quite defensive of their nest, they ignore my bare hands around the tomato plants as they hunt for caterpillars. I watch a solitary wasp drag a tomato hornworm much larger than its body a great distance through the grass. Some wasps are parasites of caterpillars, laying eggs inside the caterpillar’s body. Mud dauber wasps collect orb spiders to use to nourish their offspring. These paralyzing insects place sting-immobilized spiders inside their mud nests to feed the developing mud dauber wasps. Carnivorous throughout most of the year, yellow jackets seek carbohydrate in the fall and try to enter bee hives for the honey. Numerous species of butterflies visit sunflowers, and single monarch butterflies pass overhead in their fall migration. Keeping honey bee colonies in urban areas presents certain challenges not faced in rural areas. Beekeepers must be even more careful in protecting people and pets when bees are kept in public spaces within cities. We should make considerations to avoid contacts between bees and humans as much as possible. Bee hives need to be placed so that the bees won’t regularly fly through pathways or areas used by people. Since honey bees take in large amounts of water, they can be expected to frequent any water source in a nearby sunny area. A water supply should be maintained near the bee hives to prevent encounters with people at swimming pools or fountains. Measures should be taken to reduce swarming, and colonies should be monitored for gentleness. Excessively defensive colonies should be re-queened. Care should be taken to avoid bee encounters with young children or the elderly. If public areas hold outdoor social or recreational events, the open areas may prove unsuitable for bee hives. 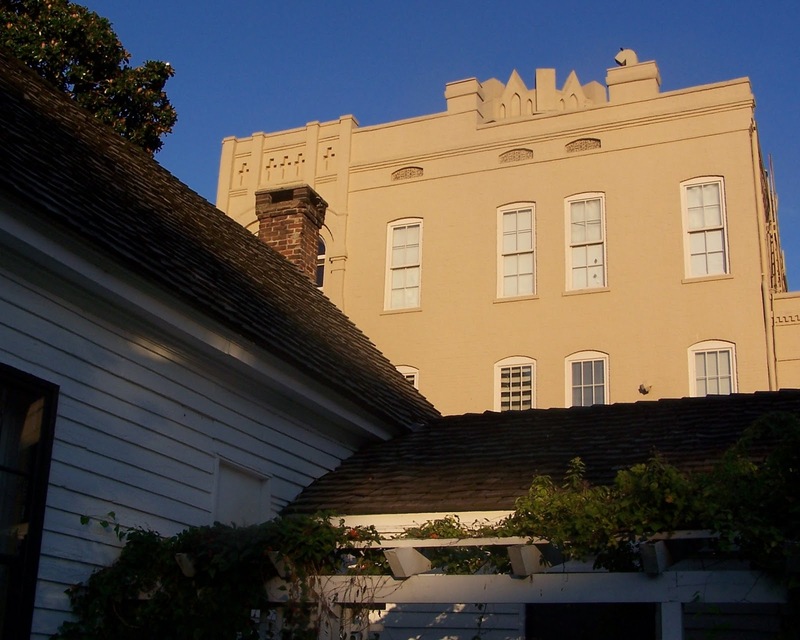 Kjeld Petersen maintains the bee hives at the Magevney House in downtown Memphis. The bee hives are part of the 1850 kitchen garden. Along with food for the family, the garden supplied medicinal, dye, aromatic, and pollinator plants. Home gardens were of great importance for everyday life. I assisted Kjeld temporarily move a bee hive to allow for maintenance in the garden. Access to bee hives in public spaces should be carefully planned to allow for the beekeeper to work in the bee hives and provide for lawn, garden, and building space maintenance. Kjeld and I moved the bees before dawn. As we finished the move, the sun illuminated St. Peter’s Catholic Church above the Magevney House. Catholic services were held in the Magevney House in the 1830s. The owner, Eugene Magevney, a pioneer teacher and civic leader, immigrated to the United States from Ireland in 1828. He died in the yellow fever epidemic of 1875. Honey bees help preserve the nature of these historic gardens. Small hive beetles are invasive bee hive scavengers. For the past decade, small hive beetles have been an aggravation at times and a serious problem at other times since their introduction into the US. Beetle populations explode in weakened or queenless hives. Adult small hive beetles, which alone seem to do little harm, live among the bees. The hard wing coverings of the adult beetles protect them from honey bee stings. Since the bees can’t kill the intruding beetles, the worker bees in strong hives drive the adult beetles to the outer edges of the brood nest and honey supers. They also capture adult beetles and trap them in “jails” made of propolis, or bee glue. The narrow space between the ends of frame top bars and the edge of the hive boxes make convenient small hive beetle jails. Since some worker bees are deployed as beetle guards, an additional portion of the worker bee population is occupied. The real problem with small hive beetles is the damage done by their larval stage. The beetle larvae eat everything in the hive: comb, brood, honey, and pollen. The beetles are particularly attracted to the protein in pollen. As the beetle larvae eat their way through a hive, they leave a trail of waste similar to the trail left behind a garden slug. The waste hosts yeast that ferments the honey and gives the hive the odor of rotting oranges. The odor attracts adult beetles that fly in from great distances. The odor also causes honey bees to abandon the hive. Researchers from the University of Arkansas are searching for natural biological agents that may be exploited to help control small hive beetles. Natasha Wright and Jon Zawislak are at Peace Bee Farm capturing adult beetles and sampling the soil around bee hives searching for nematodes, bacteria, or other microscopic agents that might attack small hive beetles. The beetles are particularly vulnerable when they leave the hive to pupate in the soil. It is harvest time for beekeepers and other farmers in the Arkansas Delta. 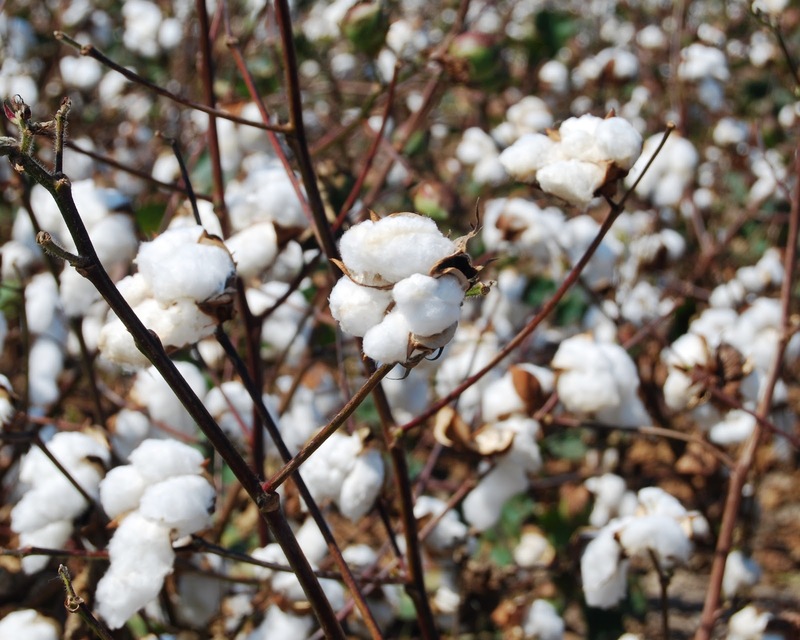 One of our important nectar sources for honey is cotton. Bolls of cotton fibers are open and ready for harvesting. During the heat of summer, cotton supplied large quantities of nectar for honey bees. Cotton honey is light in color and mild in flavor. A new beekeeper successfully completed his first honey harvest. With his honey sealed in containers, he asked me what he should do next for his bee hives. I congratulated him on his harvest and told him that his harvest of a surplus of honey indicates that he managed his hives properly. For a beekeeper to collect any surplus honey at all, the colonies must be healthy and have strong populations. The colonies’ population build-up must be timed so that there is a large population of bees at the start of the major nectar flows. If the colonies are expanding during major nectar flows, like that of cotton, there will be little surplus honey for the beekeeper to harvest. Hive treatments to reduce parasitic mites can only be applied when there are no honey supers in place. I told the novice beekeeper that if he detected a number of Varroa mites, now is the time to reduce their numbers. The decision of whether to treat depends upon the bees’ mite loads. If the mite load is low, treatments are not needed. I suggest using a "soft" treatment like ones produced from essential oils or organic acids. The "hard" chemicals are miticides that tend to build up in the beeswax comb, lead to chemical-resistant mites, and cause sterility in drones and queens. The soft treatments are often applied inside the bee hive in a gel form that evaporates. Vapors, which are contained in the hive by covering screened bottom boards, kill exposed Varroa and tracheal mites. Treatments need to be made fairly early in the fall because cold temperatures may prevent the gel from evaporating.